Goddess Parvati is worshipped in Hindu religion as the consort of Lord Shiva. She is regarded as the amalgamation of feminity, love, affection, nurturing power, strength as well as calm. Devotion and loyalty for her spouse are special attributes of Parvati. The creative energy of the universe resides in this Mother Goddess and she also symbolizes fertility. The names of Goddess Parvati reflect feminine attributes like beauty, grace and gentleness combined with immense power. Goddess Saraswati is the Hindu goddess of knowledge, wisdom, learning, art and music. She is regarded as one of the Trinity or Tridevi along with Lakshmi and Parvati. She is immensely powerful and celebrated as&nbsp;feminine deity of healing &amp; purifying power of abundence according to Rigveda. 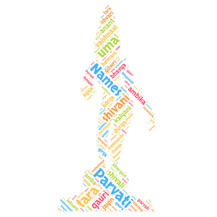 We've collection of 50 best names of Goddess Saraswati.